Natural Killer (NK) cells are part of the innate immune system. First described for their capacity to directly kill tumor cells without prior sensitization, NK cells are now known to participate in a variety of immune responses, including host protection against viruses, parasites, bacteria and tumor cells. They also play an important role in stem cell transplantation and pregnancy. NK cells perform their effector functions by either mediating direct cell lysis or by producing a plethora of cytokines. Although typically studied in the mouse spleen, NK cells are also found in other organs, such as the thymus, lung and liver. NK cells develop mainly in bone marrow (BM). The NK cell developmental process has been progressively dissected, starting from committed precursors (NKP: Lin−/CD122+/NK1.1−/CD49b−) and immature cells (iNK: NK1.1+/CD49b−CD11blow/CD51low), to a mature NK subpopulation (mNK: CD49b+/Ly49s+). NK cells make up 3–4% of total lymphocytes in spleen tissue and less than 1% in lymph nodes. A key marker of the NK cell lineage is CD27, a member of the TNF receptor superfamily. Its expression combined with the integrin chain CD11b, defines four sequential developmental stages of NK cells: CD11blowCD27low, CD11blowCD27high, CD11bhighCD27high, and CD11bhighCD27low subsets (PMID: 19234143). These NK cell subsets differ widely in tissue distribution (PMID: 16424180). CD11blowCD27high NK cells are predominantly found in bone marrow and lymph node, whereas CD11bhighCD27low NK cells are more abundant in blood, spleen, lung and liver, and double-positive CD11bhighCD27high NK cells are more homogeneously distributed. The main source for mouse NK cells is single-cell suspensions from spleen and lymph nodes, which are used for many downstream applications, including isolation of cell subpopulations, cell culture, or flow cytometry analysis. Dissociation can be fully automated using the gentleMACS™ Dissociators and dedicated tissue dissociation kits (e.g., Spleen Dissociation Kit, mouse). A special protocol for the preparation of single-cell suspensions from mouse spleen without enzymatic treatment can be downloaded from the Related Resources panel to the right. Alternatively, tissues can be dissociated manually. For details, see related chapters. The NK Cell Isolation Kit, mouse enables isolating untouched NK cells from single-cell suspensions of murine spleen. Non-NK cells (i.e., T cells, dendritic cells, B cells, granulocytes, macrophages, and erythroid cells) are magnetically labeled with a cocktail of biotin-conjugated antibodies and Anti-Biotin MicroBeads, and then depleted to generate highly pure unlabeled NK cells. The kit is optimized to give outstanding purities in C57BL/6J and BALBc mice. NK cell isolation from single-cell suspensions of spleen. NK cell isolation from single-cell suspensions of spleen. NK cells were isolated from BALB/c mice using the NK Cell Isolation Kit, a LS Column, and a MidiMACS™ Separator. The cells were fluorescently stained with CD3-FITC, CD49b-APC, and Anti-NKp46-PE. Cells were analyzed by flow cytometry using the MACSQuant® Analyzer 10. Cell debris and dead cells were excluded from the analysis based on scatter signals, CD45-VioGreen™, and 4’,6-diamidino-2-phenylindole (DAPI) fluorescence. NK cell isolation from single-cell suspensions of spleen. NK cells were isolated from C57BL/6 mice using the NK Cell Isolation Kit, a LS Column, and a MidiMACS™ Separator. The cells were fluorescently stained with CD3-FITC, CD49b-APC, and Anti-NK1.1-PE . Cells were analyzed by flow cytometry using the MACSQuant® Analyzer 10. Cell debris and dead cells were excluded from the analysis based on scatter signals, CD45-VioGreen™, and 4’,6-diamidino-2-phenylindole (DAPI) fluorescence. The Anti-NKp46 MicroBead Kit and the CD49b (DX5) MicroBeads, mouse are used for the positive selection or depletion of mouse NK cells from single-cell suspensions of lymphoid and non-lymphoid tissues or from peripheral blood. Positive selection of NK cells. NKp46+ NK cells were isolated from BALB/c mouse spleen using the Anti-NKp46 MicroBead Kit, two consecutive MS Columns, and a MiniMACS™ Separator. Cells were fluorescently stained with CD3ε-APC and Anti-NKp46-PE and analyzed by flow cytometry using the MACSQuant Analyzer. Distinct separation of CD49b (DX5)+ cells. Isolation of mouse NK cells from a single-cell suspension of mouse spleen using CD49b (DX5) MicroBeads, a MiniMACS Separator, and an MS Column. Miltenyi Biotec has developed numerous products for the analysis of the NK cells and cell subsets found in mouse spleen and lymph nodes. The REAfinity antibodies combined with a wide selection of Vio® Dyes characterized by high fluorescence intensities and low spillover, enable successful NK cell analysis. Single cell suspension from C57BL/6 mouse spleen was fluorescently stained with Anti-NK1.1-Pe-Vio770, CD11b-VioBlue CD335 (NKp46)-FITC, CD27-APC, CD45-PE-Vio615, Anti-KLRG1-PE, CD3-APC-vio770, CD19-APC-vio770 and analyzed by flow cytometry using the MACSQuant ® Analyzer 10. NK cells were defined as CD3-CD19-NK1.1+NKp46+. Four NK cell subsets can be dissected using CD11b and CD27 expression as follows: CD11blowCD27low, CD11blowCD27high, CD11bhighCD27high, and CD11bhighCD27low. Further analysis of KRLG1. typically expressed by mature NK cells, was assessed from the gate CD3-CD19-NK1.1+NKp46+. Cell debris and dead cells were excluded from the analysis based on scatter signals and 4’,6-diamidino-2-phenylindole(DAPI) fluorescence. NK cells are widespread throughout lymphoid and nonlymphoid tissues. In most, NK cells represent only a minor fraction of total lymphocytes, from 2% in mouse spleen to 10% in mouse lung (PMID: 18425107), and there are differences among mice strains. 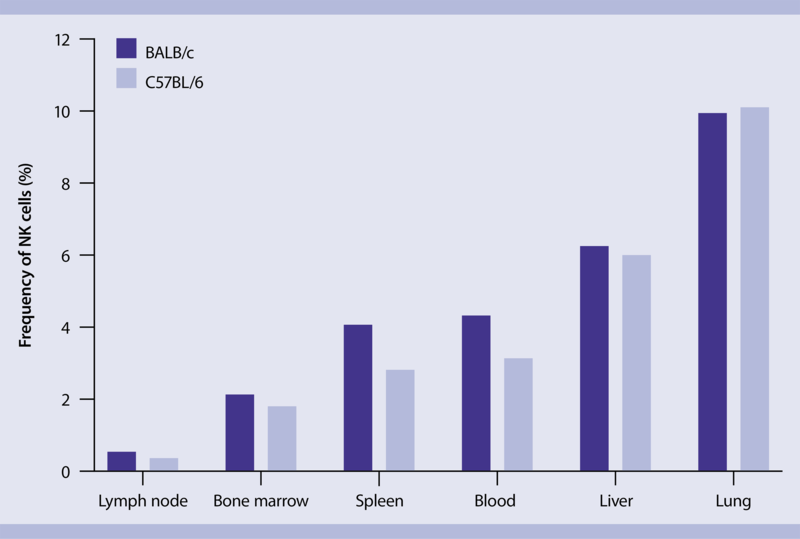 Measured frequency of NK cells in various tissues of BALBc and C57BL/6 mice strains. Presence of NK cells in peripheral organs is presumably the result of chemokine-mediated migration from peripheral blood (PMID: 17979846). NK cells express several chemokine receptors, including CCR2, CCR5, CXCR3, and CX3CR1, which facilitate targeting specific NK cells to the relevant chemokine-producing organ. The complexity of NK cell phenotyping makes it essential that all epitopes needed to identify subsets are preserved during tissue digestion. Miltenyi Biotec offers kits for the dissociation of various tissues — including lamina propria, liver, lung and skin — and the preparation of single-cell suspensions optimized to preserve epitopes. For details on sample preparation, see MACS handbook chapters on mouse cell sources and our specific tissue dissociation kits. Miltenyi Biotec has developed numerous products for the magnetic separation of cell types and cell subsets found in various mouse tissues. For details on MACS® Cell Separation Technology, see the MACS Handbook chapter Magnetic Cell Separation . Depending on mouse strain and on NK cell phenotype, NK cells can be magnetically enriched after tissue dissociation with dedicated tissue dissociation kits, by positive selection with CD49b (DX5) MicroBeads, mouse or the Anti-NKp46 MicroBead Kit, mouse. Perfused liver tissue was dissociated using the Liver Dissociation Kit, mouse followed by enrichment of NK cells using CD49b (DX5) MicroBeads.